Sonakshi recently released the trailer of the flick on her Twitter handle which proves that this outing seems to be an interesting role play for the actress. Mumbai: The Dabangg girl of Bollywood Sonakshi Sinha will next be seen portraying the role of a journalist who wants to get into hard journalism but is being forced to cover a Sunny Leone story, which disappoints her. Sona recently released the trailerof the flick on her Twitter handle which proves that this outing seems to be an interesting role play for the actress. Also Read: Don't just freeze! Act, react and 'kohni maar' in self defense! 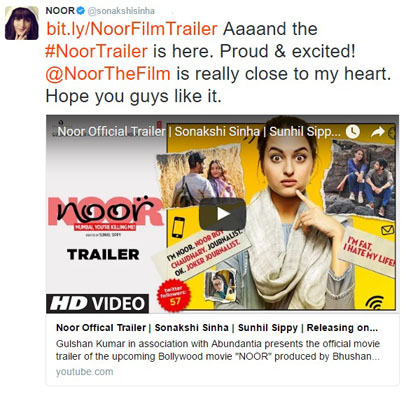 She wrote on her social media, "Aaaand the #NoorTrailer is here. Proud & excited! @NoorTheFilm is really close to my heart. Hope you guys like it." The 29-year old is shown as a clumsy girl, who parties hard with friends and sulks every now and then because of her weight issues. In the second half of the 2 minute 20 second trailer, Noor gets an interesting story to work on which eventually unfolds a lot of shocking details on Mumbai city. 'Noor' is based on a novel Karachi, 'You're Killing Me!' and has been written by a Pakistan author Saba Imtiaz.